Location: northern germany I searched ebay and the WWW, looks like no one sells this (overseas) anymore. Nothing on Ebay. I'm changing over to discs again and need it for the caliper brackets. Someone here willing and able to get it localy and ship to Germany? In Germany you either get 6 or 8mm. 6 is a bit too thin, and 8 too thick. Why do you want to use 7075? It is very strong but prone to corrosion and can't be welded. How big a piece do you need? IMHO 2024 is almost as strong and not as prone to corrosion. Location: northern germany It will be painted and it is the strongest (regular) aluminium. No need for welding, I would never use welded aluminum as an caliper bracket anyway. I have a sheet of 5052 but might be able to get you 7075 if I know how much you need. Location: So. California Sid, would McMaster Carr ship to Germany? They sell it and you can get what you want directly from them. Location: northern germany Thanks Nathan for the link! I ll try to find out, but usually they charge you an arm and a leg for sending overseas. We can ship our products throughout the world using air and ocean transportation services. We evaluate international orders from all new customers to determine whether we can accept them." Location: Netherlands Why not mill down a 8mm piece to 6,5 - 7mm? Why not mill down a 8mm piece to 6,5 - 7mm? My reason that I piece together a disc brake kit is to safe money. I could buy one from Wilwood with brackets that i could convert to FL spindles for 800-900+ +shipping, tax, duty. I don't have a the facilities to mill down anything. I would have to let it done in a shop for $100 000/h or someting like that. I could as well buy that aluminum sheet on ebay right now for $320 + shipping. Location: Netherlands My '57 Chrysler has Wilwood brakes retrofitted onto its spindles. I once start writing down all the partnumbers to copy the setup to another car, but costs added up quickly and decided I was better off fabbing my own. I have a pic of the setup somewhere I could post if you want. How big of a slab of aluminium will you be buying if you have to pay $320 for it? For how many cars can you create adapters? My '57 Chrysler has Wilwood brakes retrofitted onto its spindles. It is 12"x24" piece. I converted to Wilwood brakes almost 20 years ago. 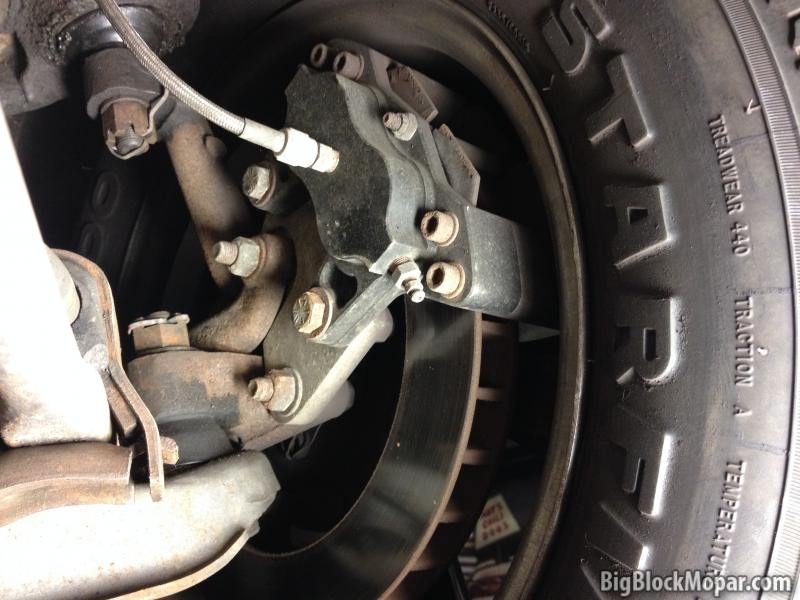 4 piston calipers with vented rotors. My Fury works so well and troublefree that I'm making my other Golden Commando a technical clone of it (not just the brakes). I posted the Wilwood part#s here some time ago. Also the conversion is so easy and straightforward, with OE spindles and hubs, it is hard to beat. You may can cobble together a kit with other parts, for a few dollars less, but when it comes to bracking, I make no shortcuts. Wilwoods are hard to beat. They are very light, that makes a noticeable improvement in handling, performance and comfort. Location: NorCal Don't know if these dimensions will do you any good. I agree the braking is just about perfect and especially braking hard from high speed, you can really feel the brake-system clamp down on the rotors and bring everything to a halt. But then again, the converted discbrakes on my '62 NY wagon using '73 C-body rotors and single piston calipers will just about put you through the windshield as well for about the costs of 1 Wilwood caliper. Don't know if these dimensions will do you any good. Thanks John, but that is 6mm, I can get that in Germany. Don't want to go under 1/4" which seems already very thin for a caliper bracket. I know that it works, otherwise I would go bigger, but can't go over 8mm (see picture). Thanks John, but that is 6mm, I can get that in Germany. Don't want to go under 1/4" which seems already very thin for a caliper bracket. I understand; I tend to over-build things in favor of strength, if I was fabricating a 1/4" caliper bracket I would use steel. Yes, I just always try to keep unsprung weight as low as possible and the 1/4" bracket came from Wilwood. Keep in mind, the brackets are only sheer-stressed, that makes the thickness not as important (provided there is no disc sideplay). Location: northern germany Just for the record, the Wilwood caliper bracket thickness is 7mm, not 1/4" (very unusual size, it was hard to measure with wheel in place) so I can switch to readily available 8mm sheet. If you'd know what I've done to save an ounce When it coms to certain things, I really go overboard. Each single weight saving might seem insignificant, but added together it makes a difference. That said, when it comes to unsprung weight, the fraction of an ounce can make the difference between life and death. The caliper bracket is only sheer-stressed and a steel bracket would add unecessary weight. The current bracket I use are modified A-body aluminum brackets that are only attached to the stock spindles with 2 bolts and on top of that are further weakened by holes and cut outs needed for A-body spindles (see picture above). Works for me over 20 years. So why add more weight? Also, aluminum is easier to work with. Location: SF Bay Area I would be willing to look into getting you some 7075. I own a machine shop in CA and we use 7075 for our injection molds. Location: northern germany Thank you very much Carl! 8mm, that I can get over here (and just received a few minutes ago) will work. Please read my message of 3-14. Thanks again for offering your help.